BTW (By the Way), before I forget to tell you, the VIA RAIL unions settled their strike, so I did not have to bail-out of Halifax early — BUT, I am glad that I did with the new schedule I developed. After spending Saturday afternoon on the porch at the Mountain View Grand with my new best friends, and then having dinner, I am now in front of a fire in one of the libraries (natch) typing (or is it now keyboarding?) away. 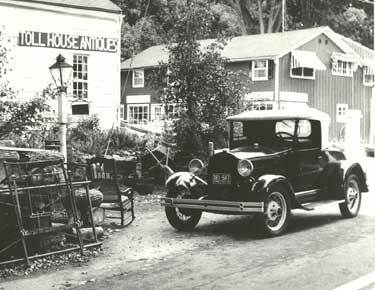 Hampshire in BELZEBUTH, my 1929 Model A Ford Roadster, I drove to the base station of the Mount Washington Cog Railway, but probably did not have the money to take the train up. 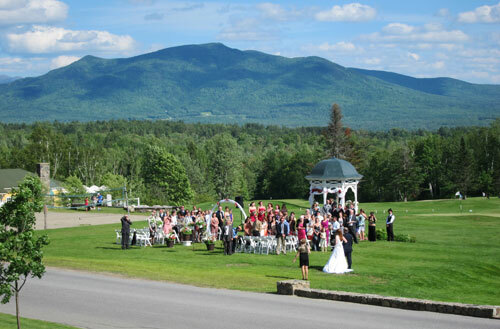 Cathy and I following a stay at the Eagle Mountain House in Jackson, NH, before we moved to NH, took the “stage” up the roadway to the top of Mount Washington. An English couple we met at the Inn joined us, and later stayed with us during their holiday. BUT, I had never been on the Cog Railway — UNTIL TODAY. This ride has been “on my list” and when I readjusted my schedule I realized that this was the perfect opportunity instead of making a separate trip up. But about ten years ago they began replacing the steam locomotives with biodiesel ones much to my dismay. Now, the only scheduled steam run is at 8:15 AM (yes, in the morning Betty), but you are asked to arrive at 7:30. If you are going to do something – DO IT RIGHT !!! So, yes, I planned to get up at 6:30 (was awake at 3:30 AM anyway) to be on the road at 7 AM to arrive in time for this adventure 50 years in the waiting. Some FAST FACTS: The steam trip takes an hour each way – biodiesel 38 minutes. The greatest grade is about 35% which means that there is a 16 foot difference in elevation from one end of the passenger coach to the other end. We all had to try standing up, and what a tilt! So much more, but, of course, I have and have read the book RAILWAY TO THE MOON, and other histories of this tourist attraction completed and operating since 1869. Ties in with my interest in summer vacations and tourism. I am going to give you a gallery of views, which if you wish to click on an image will open a slide show. This is the TIP TOP HOUSE – the only remaining original structure, now restored by the State of New Hampshire to its original appearance. And, here are a couple of videos. 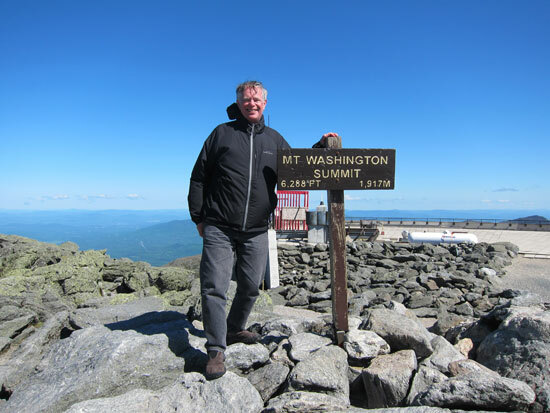 I then headed to revisit the Mount Washington Hotel where Cathy and I enjoyed several stays. Now an Omni Hotel, it was very, very busy – nice to see success, but over powering compared to the laid-back I enjoy. When Cathy and I were last there (mid-week) we were the only guests in the dining room with full-orchestra and five servers. Cathy and I enjoyed glasses of wine at this spot looking at Mt. Washington in about 2000. 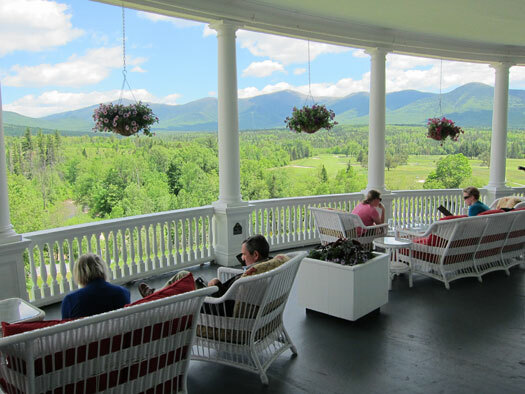 I spent from about 3PM on with Greg and Debbie (cops from Massachusetts) on the porch — what a “hoot.” Greg worked at the Inn here in the late 1960s – fifth generation to work at this Inn. Oh the stories. Hope to keep in touch. Usually I get to attend a wedding a couple of times of month at home in front of my house, and probably missed one there today. But, from my spot on the porch here I was not disappointed. Saturday wedding at the Mountain View Grand. RAY RECOMMENDS: “It is alright to do nothing!” The saying inside the wrapper of the first Dove chocolate I opened after we lost Cathy. A candy she enjoyed, and I still enjoy. That was the only time I have received this message. 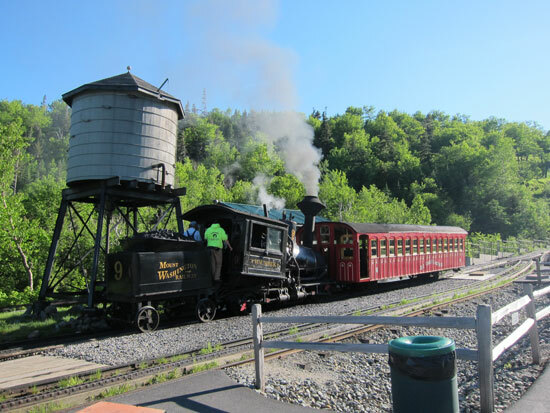 This entry was posted in 2013-a - THE OCEAN Via Rail to Halifax and tagged Mount Washington Cog Railway. Railroad to the Moon. Bookmark the permalink. Ray, what a lovely spot at the Mt. Washington Hotel. You have way of doing this. Being a woman this is probably a stupid question, but….why is the engine so low in the front, next to the passenger rail car? PS Enjoyed the video. You are a real talented tech now. Not a stupid question, Marian, but a smart one. The angle of the locomotive is to keep the water level in the boiler so the heat is even in making steam. The grades on the railway are up to 38 percent which is why the train is driven with a cog instead of the wheels moving it forward. In this case the wheels just keep the train in place. Day is not a total loss as I have learned something. Thank you, Ray. Glad things went well and return visits are with good memories. Remember that, as it could be so different. Steam, scheam, I’ll take an afternoon bio-diesel ride 😉 We were up there with the boys years ago, but drove to the top. I was too chicken to take the train. To demonstrate how cold and windy it gets at the top, I remember the video of someone throwing a cup of boiling water into the air and the water froze before it hit the ground. Do they still show that video? In the museum there was a video playing which included someone pouring Rice Krispies into a bowl – NOT! They simply sailed away horizontally followed soon by the box and the man and table. Another book to read (and one in Cathy’s collection) is – THE WORST WEATHER ON EARTH. So much to learn — it just keeps us young !!! Go for it, and do not look back !! !